He said that "It was one of the reasons I converted my farming operation to an organic, or agro-ecological, system over 30 years ago, and why incidentally we have been successfully using homeopathic - yes, homeopathic - treatments for my cattle and sheep as part of a programme to reduce the use of antibiotics," He added, "I find it difficult to understand how we can continue to allow most of the antibiotics in farming, many of which are also used in human medicine, to be administered to healthy animals. This practice could, as some have pointed out, be described as a cheap form of insurance". "Could we not devise more effective systems where we reserve antibiotics for treating animals where the use is fully justified by the seriousness of the illness? "Would we, I wonder, advise adding antibiotics to our own food or water on a daily basis, just in case we became ill?" he said. The prince's strong faith in homeopathic medicine has been a longstanding factor, which has often clashed with medical experts in the UK. 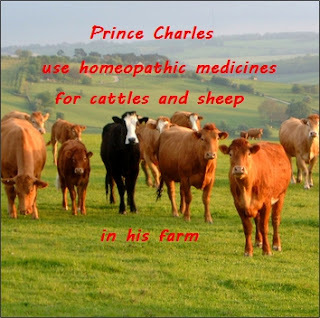 The Prince of Wales' Clarence House office later clarified, "Homeopathy is used on a case-by-case basis at Home Farm, in combination with more conventional medicine, to minimise dependence on antibiotics". There are 500 farmers trained in homeopathy and 38 homeopathic vets, according to the UK Department for Environment, Food and Rural Affairs.